By becoming a one-stop access point for healthy food, nutrition education, health screenings, and other supportive services, we are working to enable individuals living in impoverished communities to overcome hunger and related health issues while working to break the chains of generational poverty. As part of Beyond Hunger, CUMAC’s food pantry is transitioning to a health-focused, choice marketplace this year. Thanks to the generous support of the Order of St. John of Jerusalem, Knights Hospitaller, New York Commandery and Union Congregational Church, construction on the new pantry will begin this spring. Planning is now underway and by mid-summer, CUMAC’s marketplace will resemble a grocery store, where clients will be able to “shop” for what they need. These items will include fresh produce, lean meat and other quality proteins, whole grains, low-fat dairy, legumes and other healthy foods. While we work to transition to a choice marketplace, CUMAC is working with the Community Food Bank of New Jersey and the New Jersey Academy of Nutrition and Dietetics to upgrade the contents of the pre- bagged groceries we distribute to promote better nutrition by prioritizing those same healthy items. 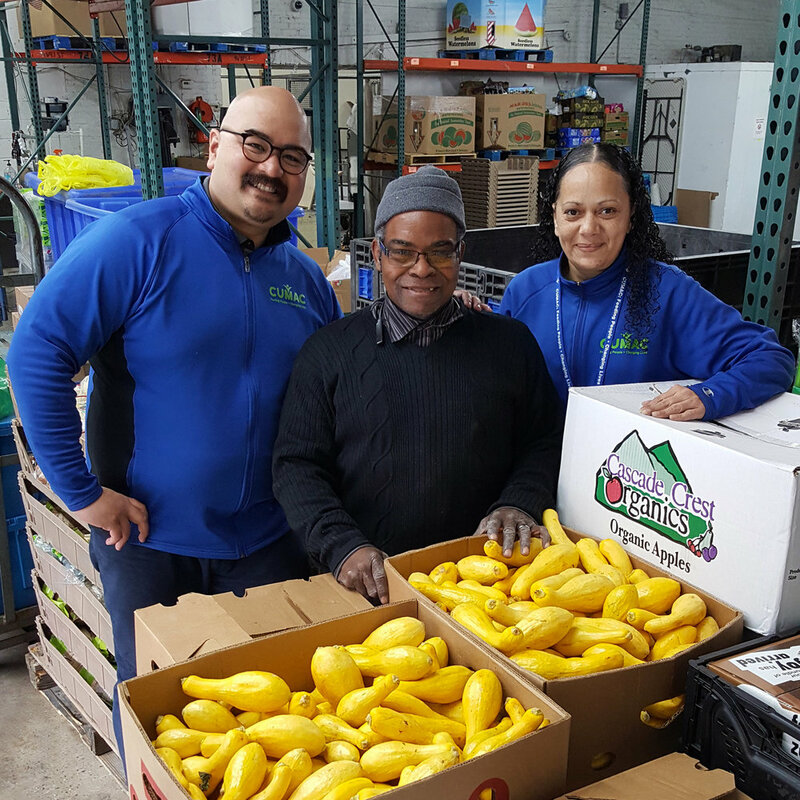 By providing healthy food we are working to help clients overcome hunger while addressing the myriad of health issues associated with food insecurity including diabetes, hypertension, obesity and other diseases. CUMAC’s pantry is already providing 30,0000 people with healthy groceries and another 19,000 people with surplus produce every year. With a larger, more efficient space, our team will be able to expand healthy food access and assist even more of our neighbors in need. Along with making healthy foods more readily available, our new marketplace will address health disparities by providing clients access to live food demonstrations, health screenings, and other supportive services. Many of these resources are already being offered in our pantry, and the new space will allow us to share these opportunities with a larger audience on a regular basis. Serving thousands of people every month provides our team with the unique opportunity to make a real impact on the wellness of our community. By collaborating with various community partners to offer wraparound services, we will help ensure that our clients have all of the resources they need to thrive. Summit Medical Group Foundation visited CUMAC earlier this month to educate our team about Diabetes. Summit covered everything from warning signs to prevention methods. It was helpful for our staff, who often work with clients at-risk for the disease. As you may already know, CUMAC recently relaunched its Pathways to Work program. Pathways is a comprehensive training program for those struggling to find gainful employment. CUMAC is taking steps to bolster this program, which serves an average of 35 participants annually, to create lasting change in our community. Pathways is now offering participants assistance with resume writing, onsite tutoring for GED prep and college readiness, mock interviews, networking options, forklift training and certification, and resources to aid with the job search process. Through a combination of onsite training, skill building, and access to resources, Pathways creates a scalable and sustainable model for job readiness training that leads to opportunities for careers. The revamped program is already making an impact. We’re proud to share that nine of our participants found full-time positions in 2018 and we are hoping to grow those numbers in the months ahead. As a final component of Beyond Hunger, we will continue to invest in our team, those we serve, and our infrastructure to make CUMAC a vibrant place to work and receive clients. In 2018, our staff made efforts to address major facility and equipment needs, and that will continue in the months ahead with our new marketplace. CUMAC is also committed to providing an empowering work environment that reflects the community we serve. CUMAC will continue to hire from our community and provide salaries that are above minimum wage with full medical benefits. Additionally, all staff will have opportunities to better themselves through professional development, financial literacy training, and access to education. Through the combined efforts of the Pantry, Pathways to Work, and providing a vibrant workplace, CUMAC is helping to empower our community with resources and services that can break generational cycles of poverty. As we continue to feed people & change lives, our team is full of hope and determination for what lies ahead. Thanks to all of our friends, supporters, and community partners that our making this new initiative possible. Together, we’re working toward a future beyond hunger.